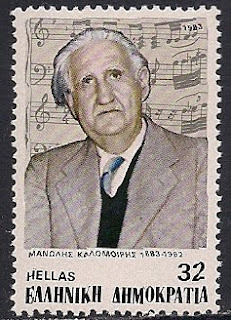 Manolis Kalomiris(1883-1962), Greek composer, studied at the Gensellschaft der Musikfreunde in Vienna, then taught at the Obolensky Lyceum in Russia. Returning to Athens, he taught at the Athens Conservatory, founded and directed both the Helenic Conservatory and the National Conservatory. He composed operas, orchestral works, concertos, and other instrumental music.